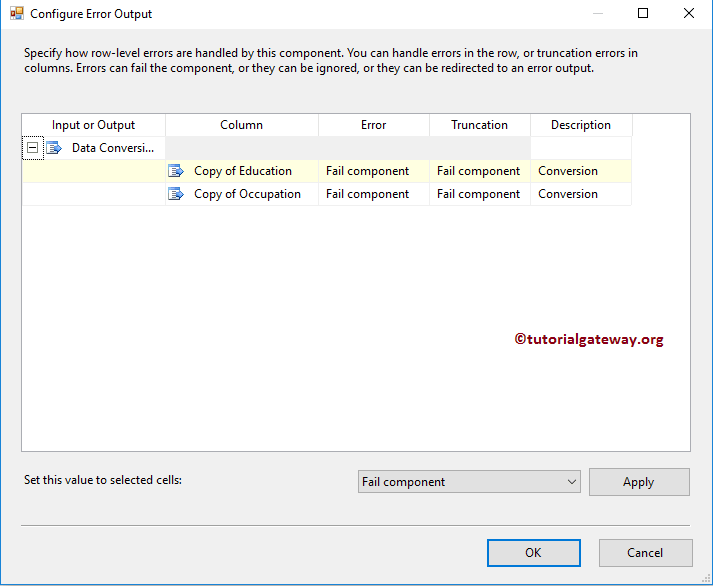 SSIS Error Handling : In SQL Server Integration Services, errors might occur when we are extracting data from a source, or loading data into a destination, or when you are performing a transformation. This is because of the unexpected data, and it is a bad practice to fail the package. To handle these situations, SSIS introduced the concept called Error Handling. 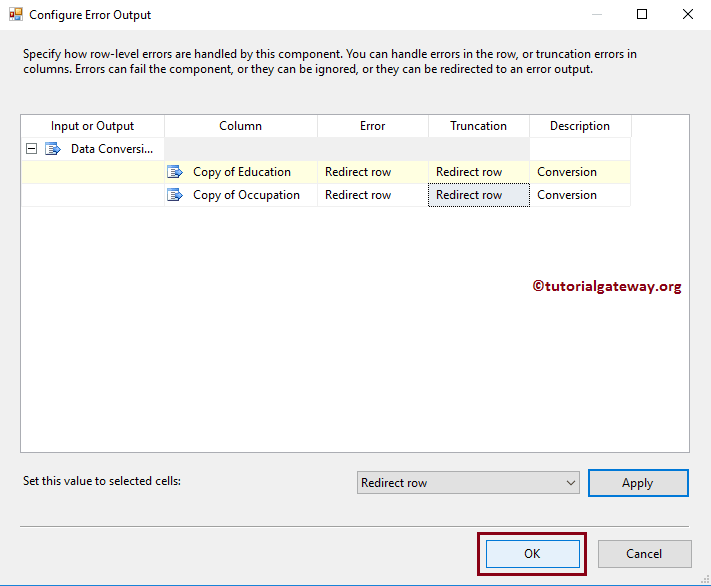 In this article, we will show you, How to configure Error Handling in SSIS with an example. 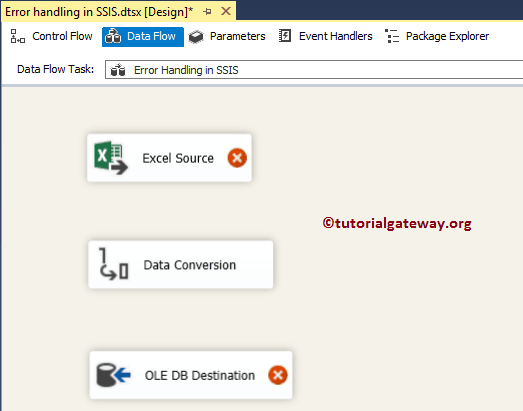 Drag and drop the data flow task from the toolbox to control flow and change the name as Error Handling in SSIS. 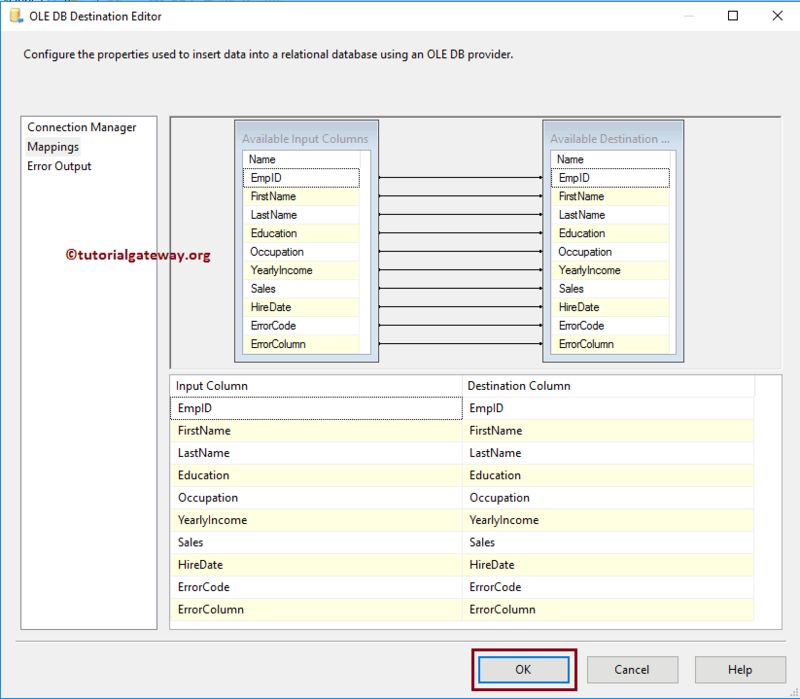 Double click on Excel source will open the connection manager settings and provides an option to select the table holding the source data. Here, we are selecting the Employees.xls file present in the file system. 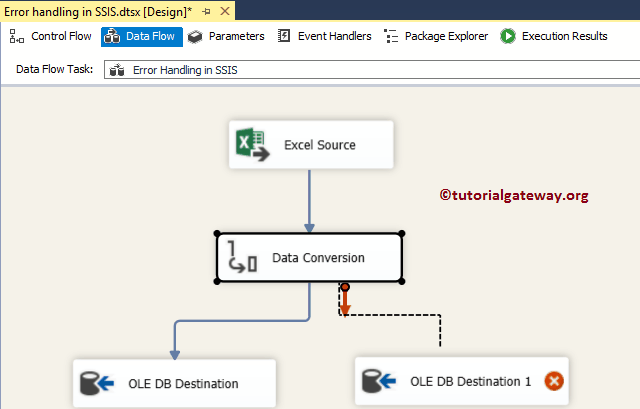 Click ok and drag the blue arrow from Excel Source to Data Conversion Transformation. This will allow the transformation to use the source data. 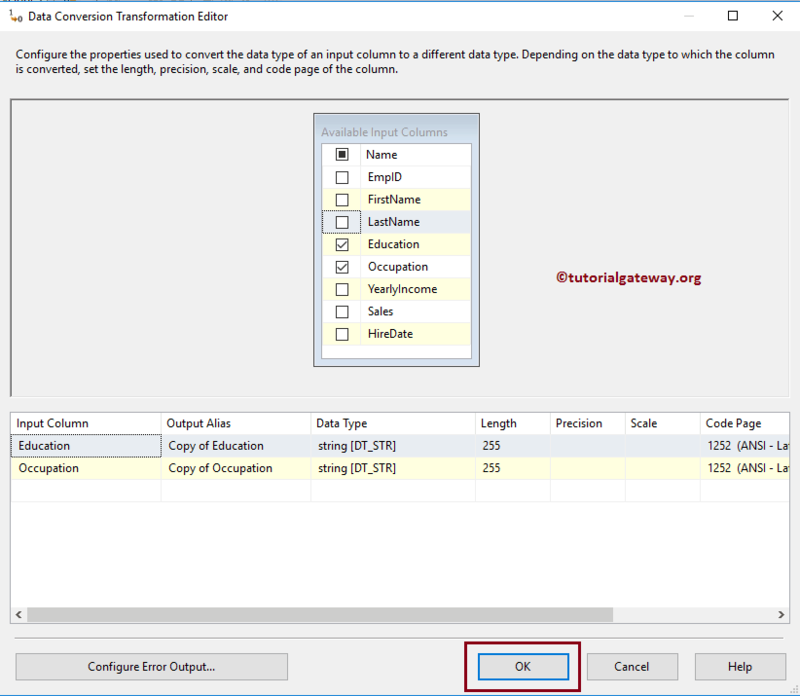 Next, Double click on the Data Conversion Transformation to edit and convert our source columns data type to required data type with length. Here we are leaving the Occupation length as 255 because we want to fail the package deliberately. 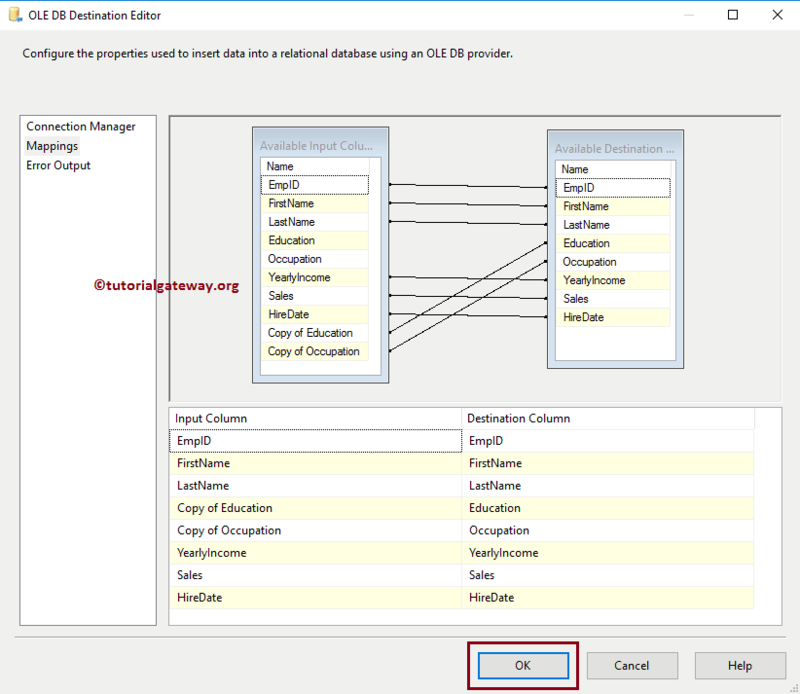 Now we have to provide the destination table details So double-click on the OLE DB Destination and provide the required information. AS you can see from the below, we selected the Duplicate Employee Error Handler table. Click on the Mappings tab to check whether the source columns are exactly mapped to the destination columns. Click OK close the above window. Drag and drop another OLE DB destination to store the error output. 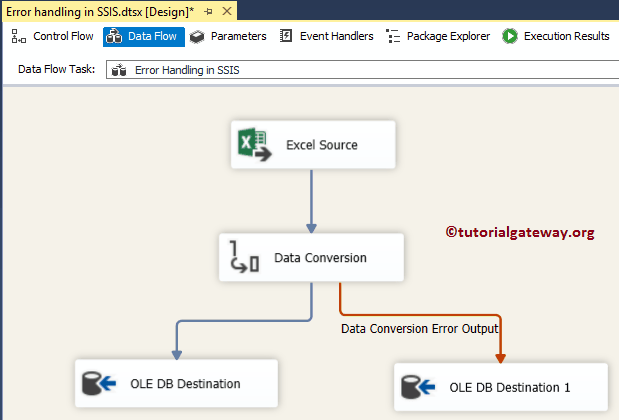 Next, drag the Red line from Data Conversion (SSIS Error Output) to OLE DB Destination 1. Fail Component: If there is an error then the transformation, source, destinations etc will fail. Ignore Failure: It will ignore the rows failures. Redirect Rows: It returns the successful rows to the specified destination and failed rows to failed output. This will not fail the task. Please change the option to Redirect Row for both Errors, and Truncation columns. 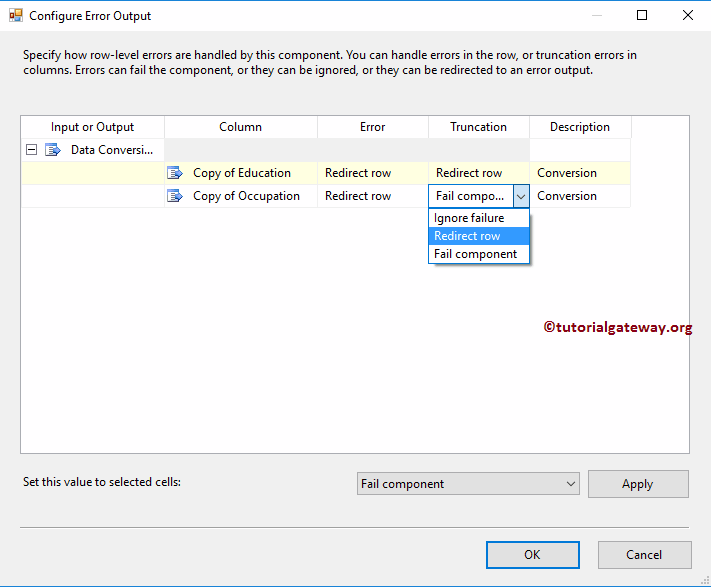 Click OK to close the Configure Error Output window. Double-click on the OLE DB Destination 1 to open the to OLE DB Destination Editor. For the time being, we are creating a new table using the New button. Click on the Mappings tab to check whether the source columns are exactly mapped to the destination columns or not. Click OK to finish configuring the OLE DB destination. Below screenshot is the final package. 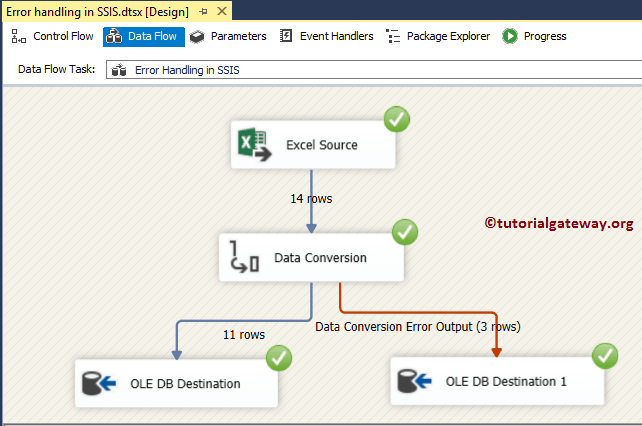 Let us run the Error Handling In SSIS package. As you can see from the below screenshot, it is redirecting 11 rows (successful) to OLE DB Destination, and 3 rows to the error output. Please open the SQL Server Management Studio to check the result. Next, open the second table to check the records returned by the Error.